This is an inactive listing. Click here to submit new dates for this event. $25 daily greens fee includes cart. $49 league entry per person. Open to the public 10-week recreation golf league Tuesday's at Beckett Ridge this Spring! 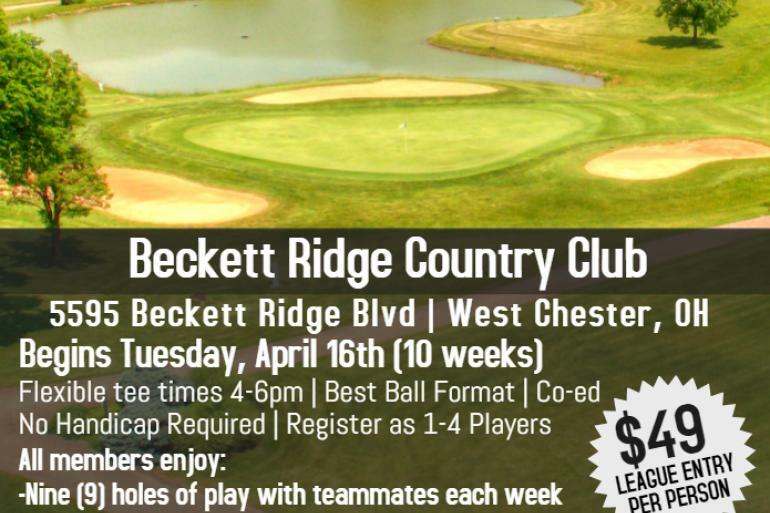 Twilight Golf Association (TGA) is hosting a 9-hole Best Ball Format league at Beckett Ridge beginning Tuesday, April 16th (10 weeks) with tee times available from 4-6pm. Register as 1-4 players. All league members receive a TaylorMade hat (Choice color) and play with teammates each week. Weekly contest holes and prizes to top team at the end of each season. Here you'll find a mix of current catalog items as well as overstocks, out-of season and scratch-and-dent merchandise — some at incredible discounts. One of the largest antique malls in Ohio with 70,000 square feet of premium shopping area, including 250 booths, 300 locked show cases and 50 display towers. Skatetown USA is a family roller skating facility located in West Chester, Ohio, just 3 miles north of the Tri-County Mall. We are just off of the intersection of State Route 747 and Union Centre Boulevard.